Wearing red dyed with your blood. On the twenty-sixth Basil was beheaded with a sword. Now sees God not subtly, but clearly. Basil slain has living grace. The Holy Hieromartyr Basil lived at the beginning of the fourth century and was Bishop of Amasea in Pontus. During his time the Eastern part of the Roman Empire was ruled by Licinius (312-324), the brother-in-law of Emperor Constantine the Great (306-337), who ruled the Western part. Licinius deceitfully undersigned Constantine's "Edict of Religious Toleration" (313), which permitted the freely open confession of Christianity, but at heart he hated Christians and continued to persecute them to return to paganism. Bishop Basil encouraged and comforted the Christians who were suffering persecution by the pagans. Licinius burned with passion for a maidservant of his wife Constantia, whose name was Glaphyra. She reported this to the empress and sought her help in the matter. Having dressed her in men's attire and provided her with money, the empress Constantia sent her away from Nicomedia in the company of a devoted servant towards the East. They told the emperor that the maidservant had gone mad and lay near death. 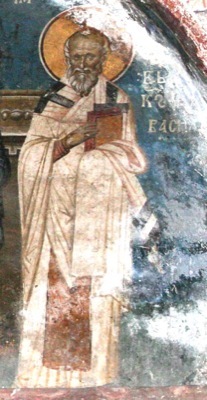 Glaphyra, on the road to Armenia, remained in the city of Amasea, where the local bishop, Saint Basil, gave her shelter. At this time the Saint was building a church in the city. Glaphyra for its construction gave over all the money that she had received from Constantia, and in a letter to the empress she besought her to send additional funds to complete the church. The empress fulfilled her request. But the letter of Galphyra fell into the hands of the emperor. The enraged Licinius demanded the governor of Amasea to send him Bishop Basil and the maidservant. Galphyra died before the edict arrived in Amasea however, therefore they dispatched Basil alone to the emperor. Two deacons, Parthenios and Theotimos, followed after him and lodged near the prison where they locked up the Saint. The pious Christian Elpidephoros bribed the jailer and each night together with Parthenios and Theotimos he visited the Saint. On the eve of the trial day of the Saint he sang psalms and the words "If I be at the very depths of the sea, even there will Your hand guide me and Your right hand hold me" (Ps. 138 :9-10) – and thrice he broke down into tears. The deacons were apprehensive that the Saint would be in distress over the coming torments, but he calmed them. At the trial Saint Basil resolutely refused the suggestion of the emperor to become a pagan high priest, and therefore he was sentenced to death. Elpidephoros bribed the soldiers with money, and they allowed the Saint to pray and to speak with his friends before the execution. After this, the Saint said to the executioner: "Friend, do what you are ordered to do" – and calmly he bent beneath the blow of the sword. When the Martyr had been beheaded, Elpidephoros tried to ransom his remains from the soldiers. But the soldiers were afraid of the emperor and they took the body and head in a boat out to the sea, throwing the head into the sea from one side of the boat while the body was thrown from the other side. After this, three times in a dream an Angel of God appeared before Elpidephoros with the words: "Bishop Basil is in Sinope and awaits you." Heeding this call, Elpidephoros and the deacons sailed to Sinope and there they hired fishermen to lower their nets. When they lowered the net "on the suggestion" of the deacons Theotimos and Parthenios, they came up with nothing. Thereupon Elpidephoros declared, that he would ask them to lower the net in the name of the God that he worshiped. This time the net brought up the body of Saint Basil, for behold, the head had reconnected with the body in a miraculous manner, with only the gash on the neck that indicated the strike of the sword. The relic of Saint Basil was honored by being anointed with myrrh and fragrant herbs and the singing of hymns, then conveyed to Amasea and buried in the church built by him. The Emperor Constantine raised up an army against Licinius, defeated, captured him and banished him into exile to Gaul where he ended his life. 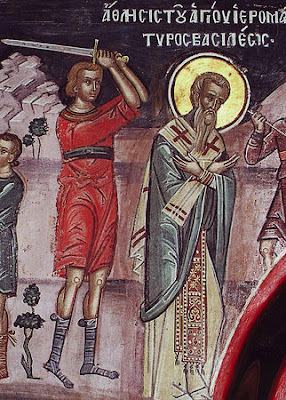 The martyrdom of Saint Basil took place on April 26th, and his relic was found on April 30th, therefore he is commemorated on both days for these events. Today his honorable skull is at Docheiariou Monastery in Mount Athos, and one of his hands is at Iveron Monastery in Mount Athos. As a minister of the King of glory thou didst withstand the lawless king, O blessed and glorious Hieromartyr Basil. When thou wast beheaded thou didst enter the heavenly mansions rejoicing. Pray that we who celebrate thy memory may be found worthy of like reward. O Basil, by defying the emperor's decree, thou didst obtain the kingdom of heaven; remember us who faithfully celebrate thy memory while thou art rejoicing there.